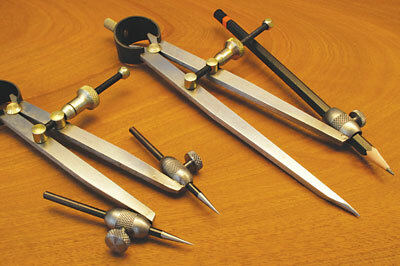 Dividers and compasses have been part of the challenge of geometry since Egyptian times. For marking circles, arcs, dividing lines and curves, they are instruments that play a very important part in the control and accuracy of these processes. I have had different sizes of dividers since my early involvement in the practical craft of furniture making from my early experience as a student. They were manufactured by Moore & Wright and although they performed well, it wasn't until I acquired an upgrade version from Workshop Heaven that I realised how basic they were. The contribution that modern engineering and manufacturing has made to many tools is a factor in the improved performance of many hand tools. This is certainly true with my new dividers and compasses. The dividers have sturdy arms and a very positive screw adjusted control that features a quick release mechanism. The arms are tensioned by a strong spring, but the marking points are, in my opinion, the major improvement. The two hardened steel rods held in place with knurled screws can be moved in and out or removed for re-sharpening. When the arms are completely closed the points don't meet exactly which at first might be considered a defect. It is in fact a feature designed to prevent the finely ground points from making contact with one another and has no effect on their overall accuracy. If the dividers are used for marking curves in metal, the points will deteriorate and the fact that they can be removed makes the process of sharpening them much easier. 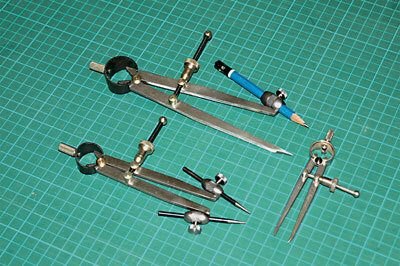 The compasses are also manufactured to the same standard of quality and robustness but the fact that they can carry a conventional pencil instead of a piece of lead plays a part in being able to sharpen the point to suit the type of line that is required. The sturdy construction provides a strong, rigid tool which holds the dimensional setting positively. Even though you may not use them on a day to day basis, it is well worth adding the dividers and compasses to your collection of marking tools.